If your grandparents are like most older adults, chances are they’re slow to embrace new technology. The idea of having an instant connection to a virtual world that fits inside their pocket is just a little overwhelming. 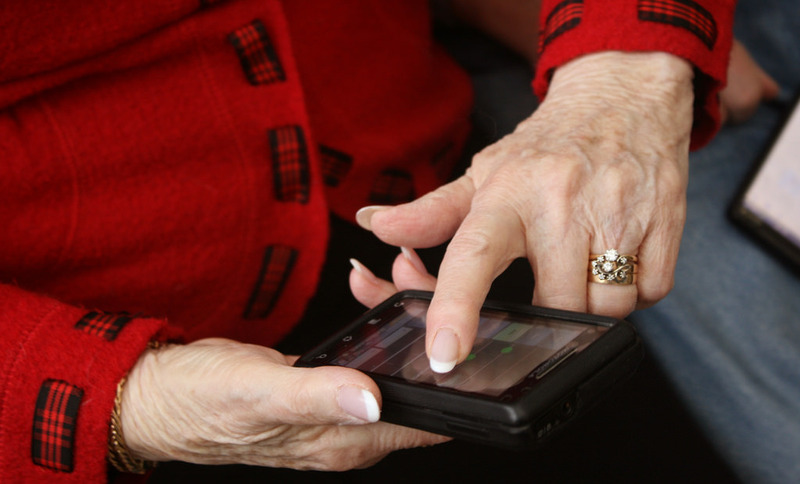 However, there are plenty of ways smartphones can be beneficial for seniors. If you’re on the fence about investing in a smartphone for grandparents, consider these benefits. As your grandparents get older, running errands around town gets harder and harder. What was once a quick stop at the store to get a few items becomes a laborious chore thanks to arthritis or weakened muscles. A smartphone can help to eliminate these tedious physical visits by allowing your grandparents to order goods online. By using sites like Amazon or eBay, your grandparents can pretty much have everything they need in life delivered straight to their home. Even better, they can complete things like banking, insurance applications, and even doctor’s visits all from the comfort of their living room. Best of all, they won’t need a computer to do any of this — a smartphone will suffice just fine. There’s probably been quite a few times when you had to repeat what you said so that your grandma or grandpa could hear you clearly. With a smartphone, however, hearing problems will be a thing of the past. Smartphones like the iPhone 7 have special hearing accessibility features, like Live Listen. This function lets you use the iPhone to amplify the sounds of real life conversation and transmits them directly into a hearing aid. If your grandparents suffer from deafness in one ear only, mono audio converts left- and right-channel audio tracks into a single channel. Even better, the Apple iOS comes with a TTY phone call feature that creates a transcript of their phone calls. Pair that with blazing fast Wi-Fi calling on the T-Mobile network, and your slightly deaf grandpa or grandma will suddenly become the biggest gossip in town. As of 2014, about 56 percent of adults over the age of 65 who used the internet had a Facebook account. If your grandparents are in this majority, having a smartphone will allow them to creep on what their favorite grandchild is doing at all hours of the day. Smartphones will let them post, like, and connect with old pals easier than ever before. Even more surprising is that 94 percent of people over the age of 50 used their phones to make video calls at least once a week. If your grandparents live away from the rest of the family, having a smartphone with video calling will allow them to stay in touch much easier. They’ll be able to keep up with all happenings of your life, which should help them feel less lonely — a problem that seniors typically face as they get older. Unfortunately, many seniors have an increased fall risk as they get older. If a senior falls out of reach of the phone, they could be waiting on the floor for days for someone to find them. There are emergency alert systems available, such as LifeAlert and MobileHelp, that let seniors press a button to get assistance. However, these systems cost a lot of money to subscribe to and don’t work outside the home. What if a senior falls while walking in the park or picking up groceries? With a smartphone, they can immediately place a call for assistance. They’ll be able to get the help they need without waiting around in pain on the ground. Plus, they’ll have more contacts to call before resorting to dialing 911; most alert companies only let you have one or two main contacts to try in an emergency before calling the authorities. Buying your grandparents a smartphone is a good idea, as it will benefit them in a number of ways. Just be sure to educate them on how to use it; otherwise, it will probably sit in the box forever. Once they have a better grasp of the technology, they’ll quickly warm up to using their phone on a regular basis.